The food and drink that you take inside your body are your fuel for your game. If you’re not fuelling right, then you’re not playing at your potential. Nutrition is a key area for any player to think about. The Pros have it easy with professional teams employing nutritionists to make sure each player has a finely-tuned fuelling programme – Cristiano Ronaldo has even employed his own personal chef. Eating well needn’t be just for the professionals; it’s something that amateur players should take seriously too. In this guide we’re going to show you what and when to eat so that your engine is firing on all cylinders whenever you need it, be it 5-a-side, Futsal, or even the full 11-a-side game. For a lot of 5-a-side players, the pre-game meal is the part that they really want to focus on, but it’s worth first understanding a bit of the theory. So let’s take a step back and break down the science behind what you’re putting in to your body. 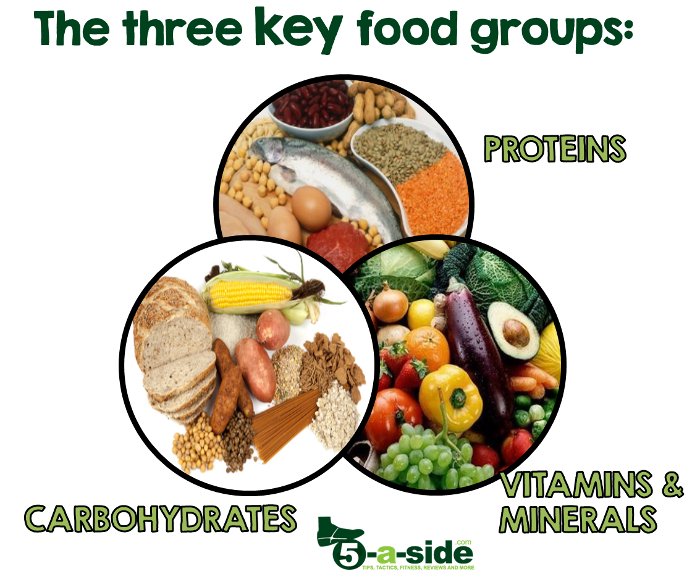 Essentially, there are three main categories that you need to be thinking about (i) carbohydrates; (ii) proteins; and (iii) vitamins and minerals. This supplies the muscles and brain with the fuel needed to carry out daily activities and is particularly needed to meet the stress of exercise – it fuels your muscle contractions, which of course are required for any movement. When you eat carbohydrates they break down into smaller sugars and anything not used straight away is stored in your muscles and liver in the form of glycogen. 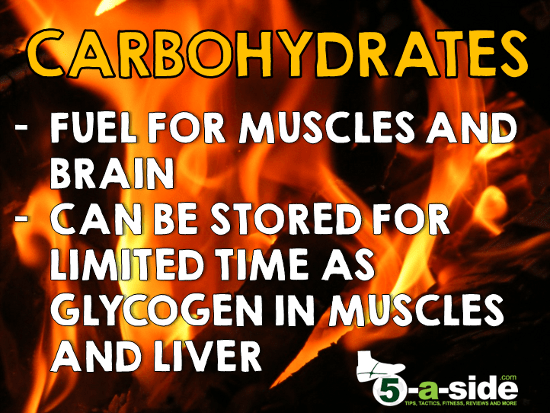 The body can only store a limited amount of this fuel type – no more than the amount needed for one day of hard training. Getting these reserves topped up to optimal levels for sport is a bit of a balancing act. If you don’t have enough then this will lead to early fatigue. On the other hand, if you over-fuel then anything in excess of what can go into your glycogen stores is turned into fat, which can linger unattractively if you don’t work hard to burn it off. There is lots of different terminology around carbs and you may have heard the terms ‘simple’ and ‘complex’; ‘high GI’ and ‘low GI’. Don’t spend your time obsessing about these terms. A healthy, balanced diet will give you the carbs you need and the focus of your day-to-day eating should be on trying to consume good sources of carbohydrates. 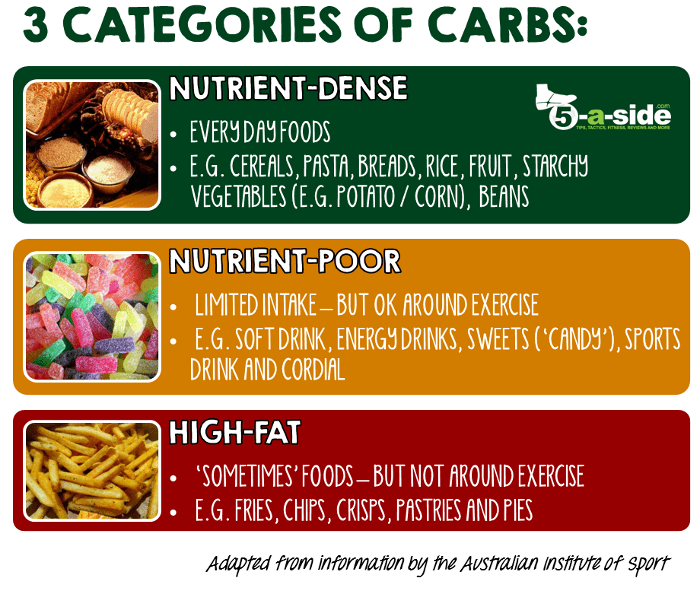 For this purpose, it can be helpful to put carbs into three categories: ‘nutrient-dense’, ‘nutrient-poor’ and ‘high-fat’. As you can probably guess, you want to focus mostly on the first of these three. Unlike carbohydrate, protein only provides a very small source of fuel for exercising muscles. 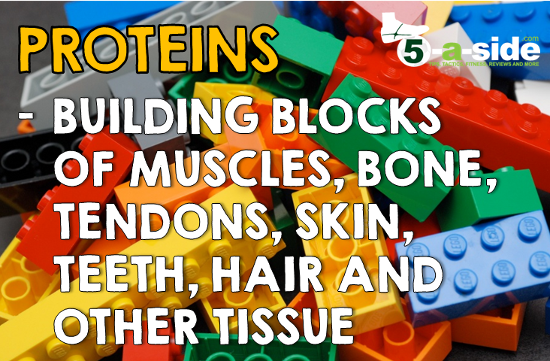 However, it’s a no less important part of your diet since it consists of amino acids which are the building blocks for making muscles, bone, tendons, skin, hair, and other tissues. These amino acids are also the building blocks for hormones and enzymes that regulate metabolism and other bodily functions. “Anyone who consumes adequate energy intake from a variety of nutrient-rich foods should be confident of meeting their protein needs, including any increases that could arise from high-level training”. FIFA F-MARC: nutrition for football. Men need approximately 55g and women 45g of protein per day. Considering that in the UK the average intake of protein is actually 88g and 64g for men and women respectively, you can see that this should not be an issue. Protein comes from a variety of sources and 10g can be provided simply by eating 2 eggs, 300ml milk, 30g cheese, 30-50g of meat, fish or chicken; or 200g yogurt. It also comes from less familiar sources – you can also get 10g from 4 slices of bread, 90g breakfast cereal, or 60g of nuts / seeds. Rather than worrying about how much protein we are getting in general, recent research has indicated that the timing of when we take the protein might be more important. A hit of 20-25g of protein is desirable straight after exercise to help your muscles to grow, repair and adapt. That’s just one of the reasons why you should take post-match recovery seriously. Vitamins and minerals are essential nutrients your body needs in small amounts to work properly and are absolutely necessary in order to maintain your long-term health. 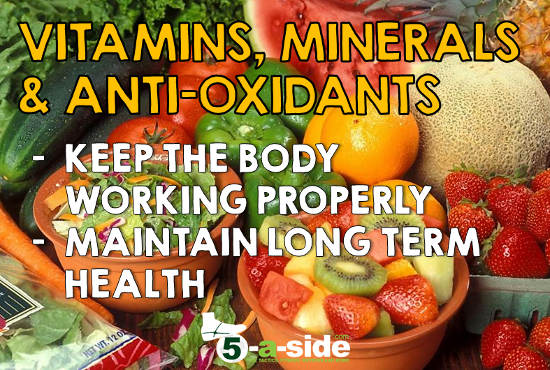 Essential vitamins include A, C, E, B6 and B12; whilst minerals include things such as iron, copper, manganese, magnesium, selenium, sodium, zinc. Frankly, that sounds like quite a strange list of things to be taking into your body but, like the oil of a car, it’s what keeps everything in nice working order. You can get all of these things from nutrient-rich foods like vegetables, fruits, beans, grains, lean meat, fish, dairy products and unsaturated oils. If you are eating a balanced diet there is no need to take extra vitamin supplements. Some might assume that fat should be totally avoided. Wrong! In fact, it can be a source of energy and certain important vitamins (referred to as “fat soluble vitamins” such as A, D, E and K) are found in fatty foods. The ‘good fats’ that you need are generally found in fish, nuts, and vegetable oils. The fats that might spring more to mind are probably: butter, cheese, whole milk, ice cream, cream, and fatty meats which we call ‘saturated fats’ and aren’t so healthy. These are fine in moderation, but a high intake can have effects on health. Fat is generally not something you need to seek out – if anything you probably want to consider cutting back on sources of fat if they’re in the form of junk food, fried food, pies and certain take-aways. Eating well in general will ensure that you have a reduced risk of injury and illness and that you maintain general fitness and an ideal bodyweight, which will help you in life in general, as well as your sport. We’ve looked at carbohydrates: ‘the energy source’; proteins: ‘the building blocks’; and vitamins and minerals which keep your body working properly. A balanced diet will give you everything you need for each of these. A balanced diet focuses on getting a mix of foods, and eating foods with high nutritional value. 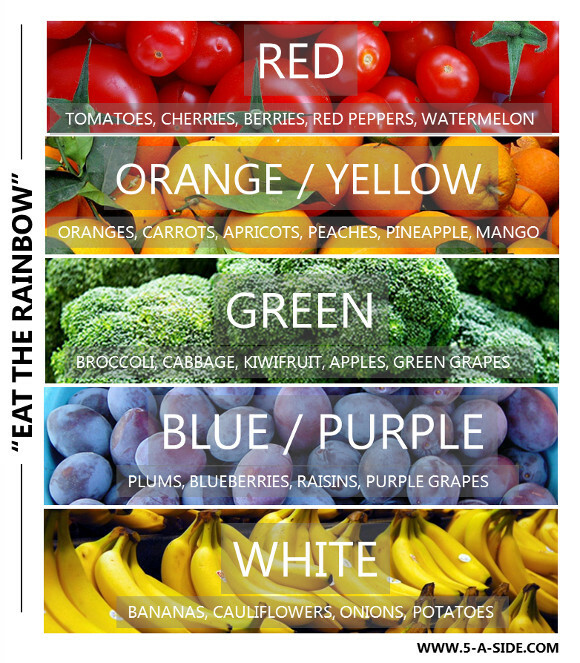 Carbohydrates like rice, grains, pasta, potatoes, vegetables; proteins such as dairy, eggs, lean meat and fish; and when it comes to anti-oxidants ‘eat the rainbow’. Cut out the crappy, convenience foods from your diet and try to eat good, natural meals. Think about your food choices, eat what’s in season, try new things and most of all find healthy combinations that you enjoy! 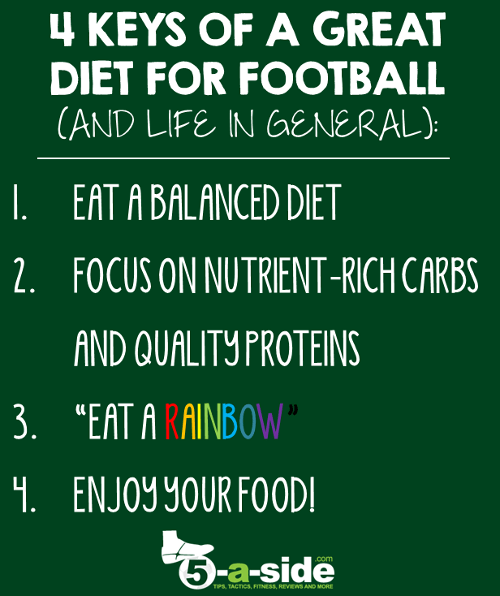 Now you know the basics, it’s time to look at arguably the most important meal: what to eat just before a game. Don’t forget though, although your pre-game and post-game nutrition is very important it’s your knowledge of the principles above and your ability to follow a balanced diet in your day-to-day eating that is much more important in the long run. What does a pro player’s daily meal plan look like? 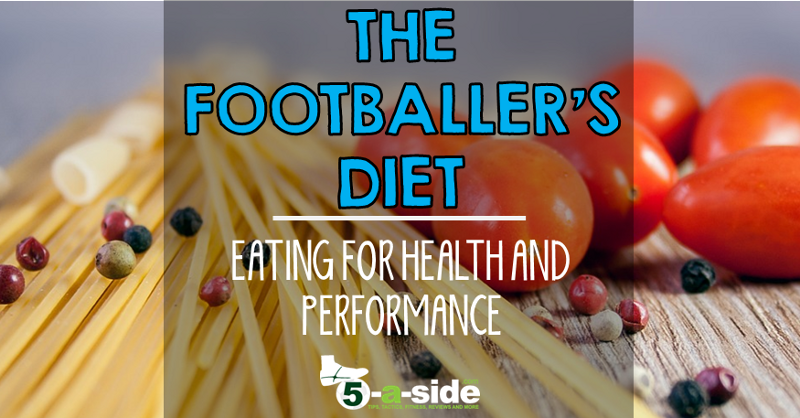 You’ve now got the knowledge to put together your own balanced meal plan, but if you want to see how a pro footballer actually eats, see our article: what a professional footballer eats. Note: some of the stock pictures in this article have been used, and adapted, under the terms of creative commons from Wikipedia. try to keep to these healthy meal tips daily. THANKS A LOT……. Hi Keith, thanks for sharing your ideas. Flapjacks are a very high-energy source. I might give them a try myself!